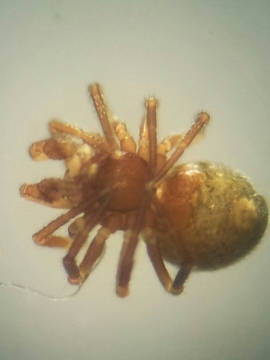 Yes, this is Nuctenea umbratica and is probably an adult male (although it would need much greater magnification to see whether the palps were those of an adult). Males are smaller than adult females and size is variable anyway. It is also very hard indeed to accurately judge size from photos. Thanks for the details. I believe this is a Walnut Orb Weaver Spider but not sure if this can be confused with other species? He (I think based on the palps that I could see) was resting on the ceiling of my bedroom last night and had moved to my window ledge this morning. Yes, this is Dicranopalpus ramosus, unmistakeable (in this country anyway) from the long apophysis on the patella. I believe this is Dicranopalpus ramosus, but I have no idea whether there are any confusion species. Sorry I lost the ends of the second pair of legs even on the "full" shot! My comment about needing to see the actual spider is not related to the quality of your photo - it is about the large amount of additional information about a spider which you can see by actually seeing the beast at different angles, positions and lighting under a microscope, which will rapidly tell you far more than photos ever can. 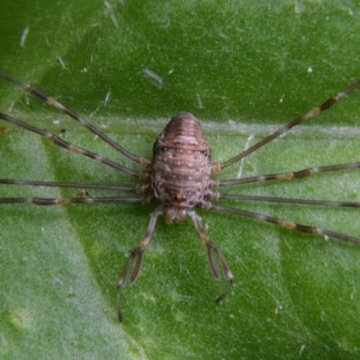 Unfortunately the only Theonoe I have are in tubes containing whole collections of spiders and it would take me a not inconsiderable amount of time to locate these, time I don't have at the moment. The most sensible thing, as always if you want a considered sensible opinion, is to send the actual spider. With no previous experience of the species, I was hoping for clear confirmation that male theonoe minutissima does not normally have a scutum or sclerotized book lung cover from someone who has collected same. Its not mentioned in the literature so I thought it unlikely. The photograph as ever is for illustrative purposes, my set-up/skill isn't good enough to provide the clarity I would like, but in this case the orange anterior end of the abdomen is a hard material. 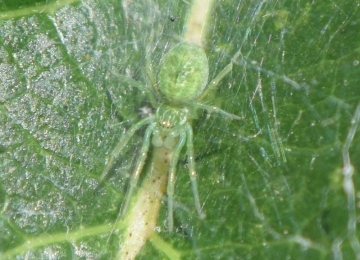 I did wonder if I had made a mistake in my determination but can find nothing in either Theridiidae or Linyphiidae with this kind of scutum in any of the literature available to me, and the genitalia, size and general habitus all match Theonoe minutussima *and* there was a female present same situation. The possibility of it something external had occured to me, but its symmetrical and tight to the abdomen, so I think not. Specimen was sieved from slightly damp leaf and pine litter in mixed woodland. I will send you the specimen if you like - I have other material that requires confirmation and/or I would value your opinion on. I don't believe the presence or absence of a scutum could be a rare anomaly. Needless to say I consider it worthless to try and make any worthwhile comments from photograph/s and would have to see the actual spider. What precisely was the habitat and location in the habitat? Yet I can find nothing in the literature about this. It seems unlikely this is an omission for LM&M and Roberts.. so is this a rare anomolay? Or a mistake on my part? Yes, this is a subadult or juvenile male Nigma walkenaeri. These mature in late summer, usually during August. Thanks for location info. 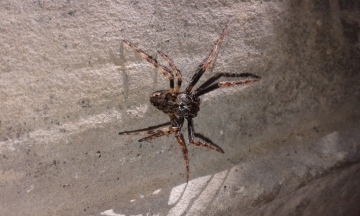 I am told this may be Nigma walckenaeri, is it possible to confirm this? Cambridge, TL46255836, 24 July 2014, on apple tree in terraced-house garden. Body + head length about 4mm. In our experience in Essex, the abdominal pattern and leg markings are simply too variable and not reliable enough for id. Ok thanks, Peter. I had hoped (obviously in vain!) that the black marks on the legs would be diagnostic. 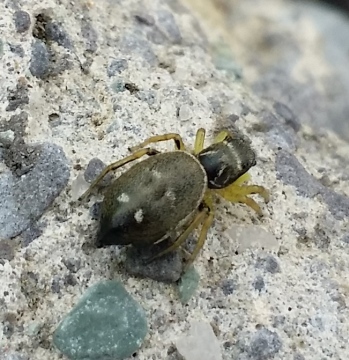 Sorry, Heliophanus can't reliably be done to species without adults under a microscope, especially in view of the very large number of European species. Certainly not Pirata latitans, and would not be possible to reliably identify Pirata species from photographs anyway. Looks like a Pardosa species, but again can't be done to species from a photo, especially a sideways view. Any chance you could take a look at this Spider photographed at Westhay Moor reserve in Somerset today please, I have searched but not been able to make a positive ID, I think it is a Wolf Spider and the closest photo match I could find was pirata latitans. 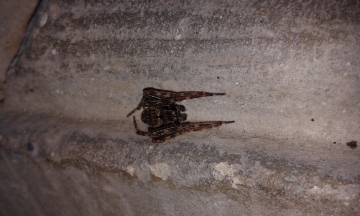 This is an immature wolf spider Pardosa species. These can't be reliably identified to species without microscopical examination of an adult.